Much has been written over the past year about the ill-fated 1-1 program in the Los Angeles Unified School district, which has now been suspended, scaled back and/or modified, depending on whose story you read. It began in the summer of 2013 with the announcement of ambitious plans to give an iPad to each of their 650,000 students. And the project began to fall apart almost immediately with questions about financial and political irregularities in the procurement process. Followed closely by breathless news reports of students “hacking” their devices to get around the security measures installed by district IT. That “hack” turned out to be nothing more than removing one file to bypass the filtering system, but it was enough to insert even more media outrage into the mess. However, in all that reporting, many writers, especially in the “traditional” media, miss a big point. They concentrated on the political (which public official should we blame this week) or the financial (Apple is doomed).1Although someone writes about that every week of every year. Missing is the fact that this was, more than anything else, a crappy instructional plan. You could start with the fact that very few if any teachers were involved in creating the proposal. As with so many of these grand ideas for improving education, the plan was pushed down on schools by administration (starting with the superintendent who claimed the devices would be “transformational”) and school board members who apparently believe that adding tech will magically fix all the other issues schools face. Officials and parents say they hope the iPads will boost achievement and help put low-income students on an even footing with wealthier ones. Many of those administrators also seemed to be far more worried about having enough connected devices for collecting data (through standardized testing, of course) rather than for student learning. The superintendent even called data a “pillar of his administration”. 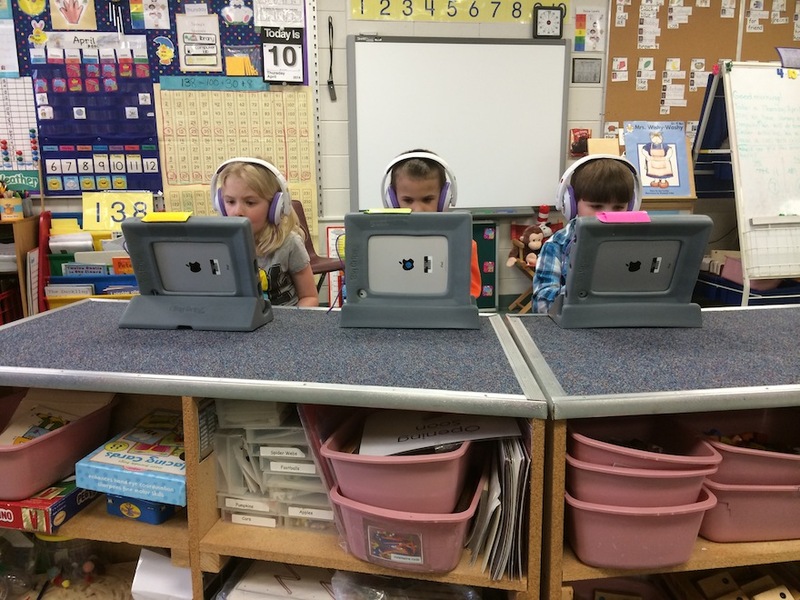 Kids, sitting in front of devices, isolated from each other, performing traditional instructional tasks.2With a “smart” board waiting behind them. Or, very likely today, working their way through canned “individualized” lessons. But it’s nothing new. We’ve done the same thing since the first desktop computers were formed into school labs and teachers trooped their classes down the hall to do Math Blaster or Reader Rabbit. Although many of the articles I’ve read blame the choice of iPads for failure of this project, it is not the device that’s at fault. Had LA schools bought Chromebooks, or Android devices, or Surface tablets, or just plain generic laptops, the ultimate result would be the same. A district spends lots of money on classroom technology while changing nothing about the curriculum, classroom practice, teacher training, or assessment. District administrators and politicians stand for photo ops followed by high minded statements about “21st century” something and creating “world-class learners”. After everyone leaves, a small number of teachers relish the opportunity and try to do great things with the devices, while most, having had minimal opportunity for professional learning, continue with the standard test prep process and only use the new technology enough to satisfy the expectations of whoever is writing their evaluation. And a few years later the next set of politicians, administrators and/or school board members come up with yet another idea to “reform” education. Now, I have a pretty lousy track record at forecasting, so I could be wrong. But in my time as an educator in an overly-large (but smaller than LA) school district, I’ve seen many, many attempts to activate the magical learning properties of technology. No one yet has found the right spell. It doesn’t exist. Not even the next shiny device to be announced any minute now. In this month’s Smithsonian Magazine, Teller, the silent (and I suspect more intelligent) half of the comedy magic team Penn and Teller, talks about the magicians art and how their work relates to cognitive science. Magic is an art, as capable of beauty as music, painting or poetry. But the core of every trick is a cold, cognitive experiment in perception: Does the trick fool the audience? A magician’s data sample spans centuries, and his experiments have been replicated often enough to constitute near-certainty. Neuroscientists–well intentioned as they are–are gathering soil samples from the foot of a mountain that magicians have mapped and mined for centuries. MRI machines are awesome, but if you want to learn the psychology of magic, you’re better off with Cub Scouts and hard candy. You’ll need to read the article to understand the Cub Scouts and hard candy reference, but it’s worth the time just to learn the process behind a card trick you’ve probably seen done. Anyway, I’ve been a fan of Penn and Teller and their type of magic act for decades. Unlike many magicians who are far too pretentious (about their “magic” and themselves), their performances not only make great use of humor but in them they work very hard to bring the audience in on the secrets. And I can testify that Teller speaks, and does so very eloquently, after attending a packed presentation he and Penn did at the Smithsonian many years ago. * One that was very entertaining without any tricks. In the same category of magicians – smart, funny, and respectful of the audience – if you never seen Ricky Jay perform, go find his excellent HBO special from the 80’s, “Ricky Jay and his 52 Assistants“, on YouTube. So how does all this magic stuff connect to education, our usual theme in this space? Sorry. When it comes to linking the two, I got nothin’. * I remember that the first time Teller said anything during the session the audience gave him a long ovation.